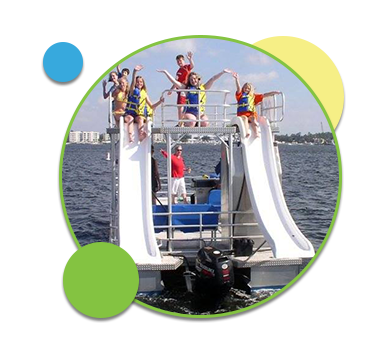 Families and groups are always looking for fun activities and things to do when visiting Destin Florida, and the ideal option is to charter a double-decker pontoon boat with two waterslides that accommodate 14 people. The new double-decker pontoon boats from Double Fun Pontoons are the most-talked about boats in town. They’re the perfect Destin boat charter to get you to Crab Island, popular waterfront restaurants, or out into the Choctawhatchee Bay for a day to remember. Chartering a double-decker pontoon boat provides your group with a fun and exciting way to experience the beautiful waters of the Gulf of Mexico. Our boat charters are new, unique, and offer so many great features.